I had meant to write about bobcats. For my first topic I needed something fascinating and charismatic, something people would get excited about. And I wanted something geographically close to me just in case I was the only person to take notice of any research I located. Bobcats seemed like a good choice, especially since I had cute pictures from time spent in wildlife rehabilitation. I was reading an article from the Spring 2011 issue of Northern Woodlands journal (“Woods Ghost: Bobcats on a Comeback” by Dave Mance III, pgs. 42-48) and I found the comment that fishers were uncommon in the Northeast several decades ago. For someone who grew up in rural New Hampshire and was very familiar with the refrain that, if your cat went missing one day, “a fisher probably got it”, this was an interesting piece of information. (On the ridge behind our house, we even found the remains of a small dog who appeared to have been “got” by a fisher- my mother briefly considered renaming our home “Dead Dog Canyon” but thankfully could be convinced that a large field with forested ridges on either side did not constitute a canyon.) So were fishers making some sort of comeback in NH or were they moving in or was something else going on? And was this something I should be concerned about? The first, and only, fisher I have seen in person was lying in the road early one winter morning as I drove east from No. Woodstock, NH on Rt. 112. While silently cursing whoever had hit it, I pulled over for a closer look, figuring this was probably my only chance to walk right up to a fisher without needing a trip to the emergency room and some shots afterward. What impressed me most about it was the size of its feet: completely enormous with huge pads and thick fur; this was an animal designed for moving, a lot. I could see tracks in the snow on either side of the road, so I think it had used that area as a crossing point several times. I have driven that road many, many times since then and seen nothing to indicate the presence of another fisher (granted, last winter would have made it a challenge to make a snowball), but I’m hopeful that the brook alongside the road will prove to be irresistible to a dispersing juvenile. So, what do I know about fishers (Martes pennanti)? They have a nasty reputation of being both well-armed and fearless and prey on porcupines, among other meals (and it does seem to me that you need a good level of self-confidence to take on something covered with quills.) 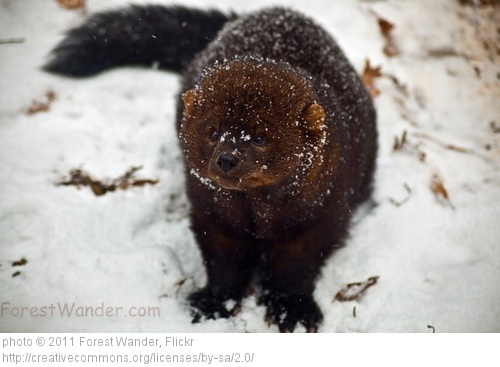 They are part of the mustelid family and are related to otters, pine martens, weasels, etc. When moving through the landscape they often use what is referred to as a 3×4 lope and may zig-zag through a forest looking for prey. I know what a fisher track looks like. But none of that really speaks to questions of population or conservation. And I’m curious about an animal that, at least in my experience, has been reviled, feared, and blamed for the disappearance of dogs, cats, and probably the odd bunny and chicken as well, by people around me. Do they really deserve their bad reputation? What role do they play in an ecosystem? How does human activity impact them? Why should we care about their continued presence around us? That’s where I’m starting from, and I hope to be able to add greatly to that knowledge base over the next week and the rest of the month. So now I’m on the hunt for fishers.